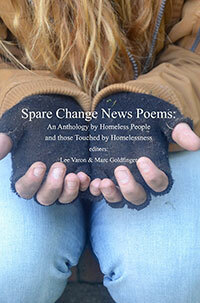 ” The Spare Change News newspaper was founded in 1992 by a group of homeless individuals and a housed advocate. Since its inception, Spare Change News has worked to elevate the voices of the homeless and economically disadvantaged people in the Boston Area. Personally– I have a real connection to the paper not only for its laudable mission of giving the homeless a voice (and in some cases a chance to make a living by selling the paper), but years ago I was an arts reporter under the managing editor at the time Linda Larson–and assisted the poetry editor Don DiVecchio. I worked closely with late assistant editor Cynthia Baron, and former editor Marc Goldinger, as well. I learned a lot during my tenure with all these people. That being said, the poetry you will find in this anthology is not New Yorker-style work. It can be raw as the streets, visceral, heartbreaking and even heartwarming. shot so many times there are bullet holes in the side of his feet. From reading this poetry it is evident that there is tragedy, and beauty on these mean streets and perhaps. ..salvation.